Sprinkles make everything happier. Especially birthdays. 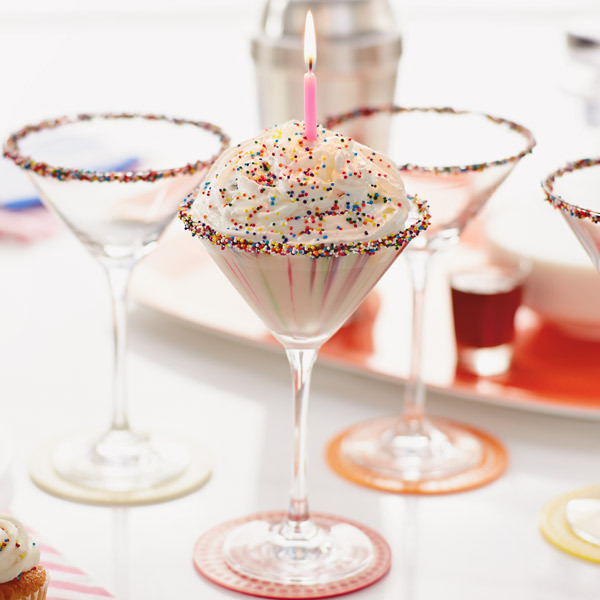 Happy-up her next birthday celebration with a birthday cake martini topped with whipped cream, colorful sprinkles and a lighted candle. This festive signature drink is sure to be just what the birthday girl wished for! Wet the rim of a martini glass and dip in colored sprinkles. Mix coconut rum, white chocolate liqueur, hazelnut liqueur and half-and-half in a cocktail shaker with ice. Strain into martini glass and top with a dollop of whipped cream. Carefully place a small birthday candle in the center of the whipped cream, light the candle, and start singing!